Behind The Candelabra was deemed ‘too gay’ for Hollywood, yet charmed the spandex off the Cannes crowd. Could this be the best bromance film ever? With the flamboyance to make Lady Gaga look like Kate Middleton, Valentino Liberace was once the world’s highest-paid entertainer. A walking contradiction, the pianist and vocalist embraced all spectrums of camp with more fur than a zoo and more dazzle than a Catherine Wheel, all whilst keeping a close guard on publicising his sexual orientation. As he spent a fortune on making the press believe he just ‘hadn’t found the right woman’, Liberace groomed pretty men behind the golden gates of his luxurious mansion. His most notorious love affair was with orphan Scott Thorson, a puppyish 17-year-old hunk who walked off with his heart when he waltzed backstage after yet another sell-out show. Matt’s performance is as dazzling as his sequin-encrusted wardrobe and as tight as his Spandex. Steven Soderbergh seized this true story and has spun it with spectacular class. The hedonistic highs and grubby lows are treated with style and compassion as he evokes what could be Matt Damon and Michael Douglas’ finest performances. Who hasn’t thought how much nicer their other-half would look if they plucked their nose hair? Liberace, (Michael Douglas), went miles further than ‘accidentally’ leaving a nasal trimmer in the fridge and insisted Scott, (Matt Damon), surgically rearrange his facial features as breezily as suggesting a game of Mr. Potato Head. The results make him look like Princess Diana on steroids. Let’s take a moment here: Matt Damon is playing a 17-year-old boy. Matt Damon is a 44-year-old man. On top of the cinematic smoke and mirrors, the guy clearly takes his vitamins. As well as the visual marvel of the make-up, Matt’s performance is as dazzling as his sequin-encrusted wardrobe and as tight as his Spandex. He shifts from vulnerable to vicious without giving us the bends as his character plummets into darker times. Michael Douglas gleams, even without the brick-thick layer of San Tropez. The veneers and wry smirks worryingly suit him and he pulls off the act without portraying the pianist as a goof or coming across as a caricature – something Soderbergh was keen to avoid. The film isn’t completely void of looking a bit Spitting Image, but it picks suitable moments to highlight the hilarity of extreme facial feng shui. 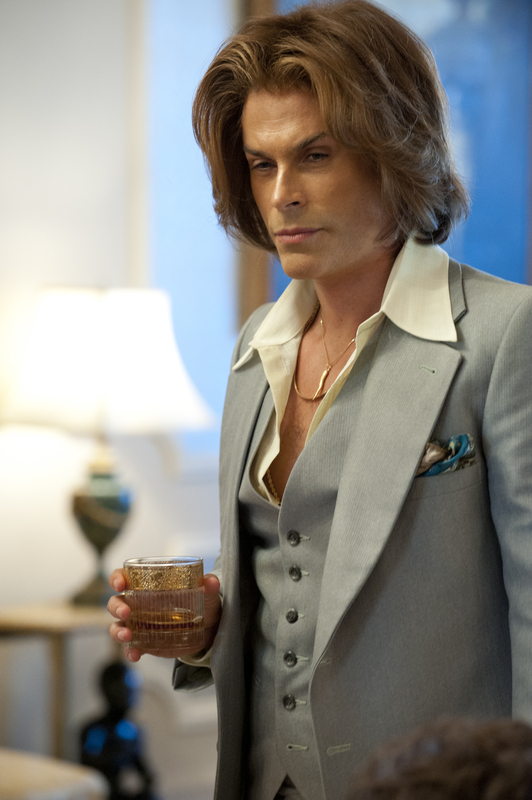 For instance, cosmetic surgeon Dr. Startz (Rob Lowe) purposefully looks like a Siamese cat trying to squeeze out a fart. But be warned, you may be put off your post-cinema kebab as some of the performed surgery literally reveals how far Liberace goes to get under the skin of his toy-boy, and how desperate he was to slice 20 years off his face. The warm reception at Cannes Film Festival proved Hollywood wrong – it’s not “too gay'” for cinemas. Soderbergh explains that he had to adapt the film for TV as film studios refused to finance a theatrical release, citing that no one would watch it “except for people who are gay”. Yes really. Currently, the US will only release a televised version on HBO, meaning the film is sadly exempt from Oscar consideration. Given that Liberace spent such effort keeping his sexuality under wraps to protect his brand, it seems ironic that the bigwigs of Hollywood are still, even now, believing that being gay is bad for business. Here’s hoping that the deserved success of Beyond The Candelabra makes Hollywood kick themselves where it hurts and make Steven Soderbergh reconsider making this his last film.